Wismec Realeaux RX200 Review - An Extremely Powerful Mod! Home → Mods → Box Mods → Wismec Reuleaux RX200 Review (2018) – A Killer 200W Mod! 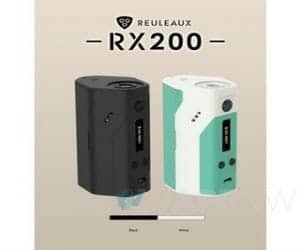 Wismec Reuleaux RX200 Review (2018) – A Killer 200W Mod! Ten thousand welcomes, my fellow vapers and thanks for stopping by! If you’re making your way up that ladder of vapes, and shopping around for something in the seriously high power 200W range, then don’t go anywhere. You better be sure to batten down the freakin’ hatches because there is a storm rolling in with this week’s Wismec Reuleaux RX200 Review, courtesy of yours truly! Wismec has been gaining fame since the release of the DNA 200 and this new release follows hot on it’s heels. They’re switching to a Joyetech chip, from the DNA’s Evolv TC chip and we’re about to see how it all adds up…Joyetech is actually Wismec’s parent company, by the way. Wismec products are USA designed but manufactured in China and they specialize in high powered gear, seemingly with a focus on performance factors over superficial looks, in my personal opinion. Nevertheless, the proof is in the pudding and all will be revealed during this Wismec Reuleaux RX200 TC Review. Now, this is a high powered, 200W TC mod with some impressive specs and versatility to boot…not for the fainthearted and most certainly not for the small handed. This power station houses no less than three 18650 batteries, which definitely justify the size. It was designed by Jaybo, a US designer and is compatible with most of your reliable sub-Ohm tanks. I must mention that there has been issues with the Smok TFV (a really popular tank range right now), concerning the connection pin’s ability to damage your RX200…the thing is, I made use of the TFV4 during this Wismec Reuleaux RX200 test and encountered no problems, in fact I found the two to be an excellent pairing, but keep in mind, that was not with extended use. Ergonomic Shape: Given the fact that this beast houses 3 x 18650 batteries and therefore needs to be humungous (which I will cover in the cons section), it does have a fairly ergonomic shape...if you have massive hands that is! The firing button is nicely positioned and if you stand it up it won’t ever fall over because of the width, that’s about as far as I can go on that front. Battery Power And Change: Now, you may have absolutely no intention of taking this thing up to it’s maximum setting and you might not even posses a tank that could help you do that. Should you want to, however…it actually is possible on this tri-battery mod, unlike many other 200W mods that cannot quite cut it. If, like me, you fancy the 70-120W poppy field then even better, you’ll have power for days, literally! The 4 x magnetized battery cover makes changing easy, although I always prefer a bottom changing system for some reason. I will give kudos on the fact that the raised rings around the connections have been dropped since the DNA 200W, as those caused problems with certain battery brands. Versatility: The TC function is compatible for nickel, titanium and stainless steel coils, making it a versatile powerhouse for use with just about any of your RTA builds. Check out some recommended RTAs here. During this Wismec Reuleux RX200 TC review I tried out a stainless setup and found the TC worked like a charm, clouds were rolling with intense flavor and above average Ramp time. Quality Of Vape: My review was a foggy business, I got some serious action out of this piece between 70 and 120W and with the right build you can push it up further, if you can afford a few liters of juice. I stayed within my favored range mostly and was impressed by the outstanding battery life, beastly performance and swift Ramp on the majority of the tanks I fitted. Vapor production off the hook! Warranty Void: Using another brand’s atomizer on this box means you void the warranty - WTF are they thinking? They obviously have no concept of how we vapers like to roll…I’m pretty disappointed by this. It has to do with this issue of 510 threading pins which are too long (not actually) and with extended use may have the ability to short circuit your device. This has been experienced for the most part with Smok’s TFV4 tanks, a freakin’ awesome tank and if you ask me…this is a design flaw on the part of Wismec, their 510 threading is too short and they should have included short circuit protection for this. Like I said, I used the a TFV4 (among others) during this Wismec RX200 review. I think the TFV8's gonna be a great pairing as well. However, if you don't want to void your warranty, it's best you go with a Wismec sub-Ohm such as the Reux. Weight and Looks: No joke, this thing is heavy as hell and there’s no two ways about it…without the batteries in, I think they could have worked to lighten it up a little. As for looks…I feel like the teal and white version looks like a toiletry dispenser of some kind and the black version looks like it belongs in the 80’s. I cannot help it, I am not, personally, a fan of this device’s looks, however well it performed during this Wismec Reuleaux RX200 Box Mod review. Let’s face it, this is actually one of the best 200W range mods on the market, plus it comes in at a considerably lower price than the DNA 200W, which was rather expensive, to be fair. It’s true, I’m not a fan of it’s bulkiness but that’s what you get when you need to squeeze in that much power. I found it paired nicely with the majority of my sub-ohm tanks but you need to be careful not to screw in to tightly because of those short thread issues. Other than that, I experienced outstanding performance and off-the-chart power and Ramp time during this Wismec Reuleaux RX200 200W TC Box Mod review (that was a mouthful, try to say that three times fast!) and if it’s build compatibility, extreme power, battery life and serious cloud production that you’re looking for…this mod definitely needs to be on your shopping list! Is that manual not making sense? Check out this video!